In the 18th Dynasty, a young Boy King became Pharaoh starting in 1332 BC, a period of Egyptian history known as the New Kingdom.The name ‘Tutankhamun’ derives from the meaning ‘Living Image of Amun’.In 1922, the then famous British Archaeologist Howard Carter and his team, came across the nearly intact Tomb and Burial chamber of Tutankhamun which received worldwide attention due to the sheer nature an wonder of this rich ornate Tombs and artifacts. Situated on the West Bank of Luxor across the Nile, is the Tomb of Tutankhamun and undoubtedly, the best preserved Royal Tombs ever discovered. 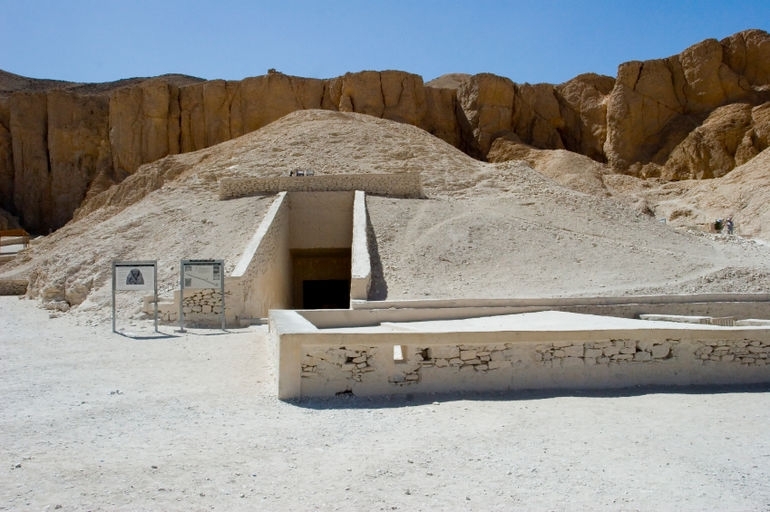 Hidden for over 3000 years, this tomb miraculously survived flooding from the Nile and Tomb Robbers which were common through the centuries. 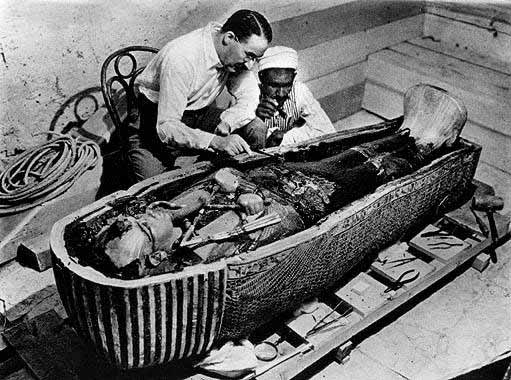 Whilst it was Howard Carter who finally found the Tomb, it was initially brought to light by an American business man, a Mr Theodore Davis who discovered items leading to the Tomb. The discovery of these items and then further excavations close by, led Mr Carter to believe that there was a huge discovery to be found nearby. A small pit close by the Tomb area was discovered with many items such as embalming materials, gold foil linen bags and broken pottery. 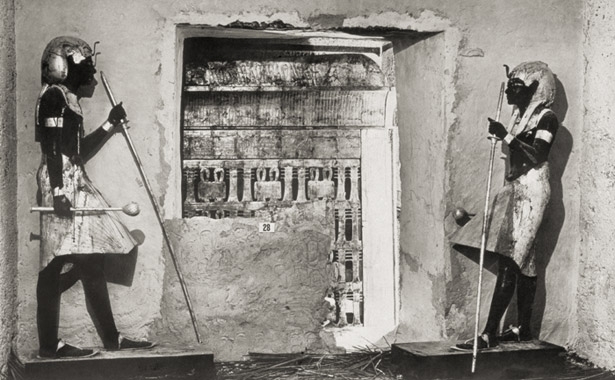 When the Tomb was actually discovered, there were several dignitaries present along with Carter including Lady Evelyn Herbert, Lord Carnarvon and Calender his assistant.After previously digging near to Ramses IV’s Tomb, they had found a workmans hut close by. On removing this hut, it revealed a step, which was to be the pivotal discovery of the main door to the Tomb. Initially, Carter drilled a small hole large enough to see through with the light of a candle, What he saw totally astounded him.Reflections of brilliant gold flashed back at him. Very quickly, they drilled further, enought to create a space big enough to squeeze through. On entering, they climbed down into a room and were taken aback by the beautiful carved golden furnishings and objects which lead to further rooms and additional artifacts. 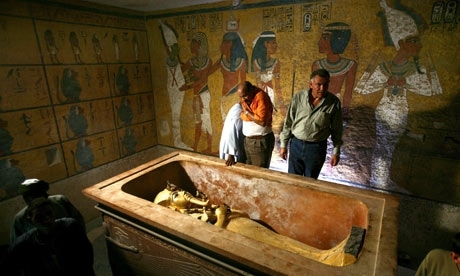 The Tomb had previously been robbed, however and fortunately, the majority of important artifacts still remained. Today, the Sarcophagus and Golden figured Head of the Boy King sits proudly in the Egyptian Museum of Antiquities in Cairo and was famously viewed and photographed with Princess Diana before her death.